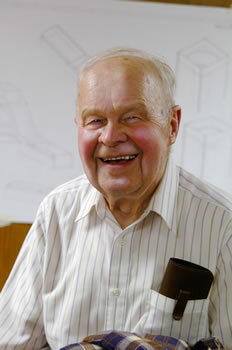 In 1974, Rudy Zarling convinced the Cedarburg Jaycees to help him build an observatory in his backyard. Zarling had been collecting telescope parts for several years and wanted to build an instrument that would be accessible to students and interested individuals. Once the wooden observatory with it’s modified silo dome was constructed, the 500 telescope parts went together in a matter of hours. For the next several years, the 12.5″ Newtonian reflector on it’s German equatorial mount served as the primary “eye on the sky” for amateur astronomers in the counties of Washington and Ozaukee. After a winter storm blew the silo roof off the original observatory, a new design was made — based on the famous octagonal barns found in the area. 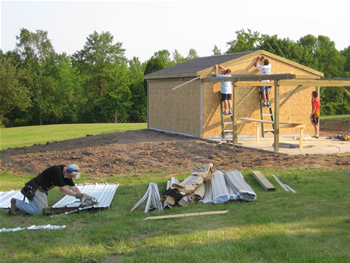 Members worked for over a year to construct the 16-foot dome and observatory building. This new observatory was completed in the early 1980s and it initally housed the 12.5″ Newtonian. Later it was replaced by a 17.5″ Newtonian, which was loaned to the Foundation by NCSF member Kevin Bert. The 17.5″ Newtonian was one of the largest amateur telescopes of it’s time. One unique feature of the telescope was a secondary mirror which could be rotated to direct starlight to any of the four sides of the square tube. The focuser would then be attached to the side by means of a simple lever locking system. The original German equatorial mounting and clock drive was modified to carry the heavier load of the 17.5″ telescope. This telescope tested the limits of wooden “square-tube” technology, and served as a test bed for several design concepts that were later incorporated into the Foundation’s next telescope-building project. During it’s early years, the NCSF made it’s existence known mostly through word-of-mouth. Koehler Insurance of downtown Cedarburg often allowed us to put up a display in their front window to publicize the group. 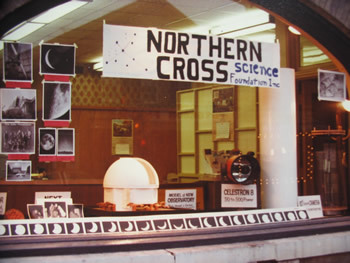 This photo shows a display for Astronomy Day 1980. Note the scale model of the 16-foot domed observatory. 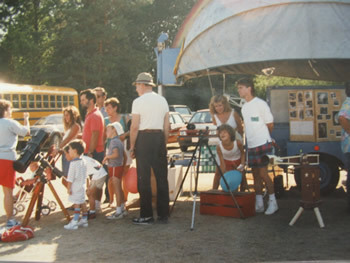 The Star Wagon was donated to the NCSF by the Milwaukee Public Schools. It was a heavy trailer upon which an umbrella was mounted. Once parked, the umbrella would be unfurled to form a fabric dome. Inside the dome the summer night sky was depicted, and this allowed the Star Wagon to act as a portable planetarium. For more than a decade, the NCSF was invited to set up in an area at the Ozaukee County Fair. 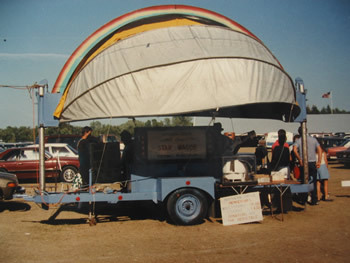 The Star Wagon served as our “booth” and people would look for it year after year, knowning they could take a look at the Sun during the day or the Mon or a bright planet at night. 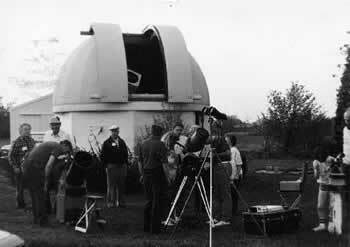 On clear nights it was not unusual to have forty or fifty people in lines waiting to look through telescopes set up around the trailer. The Star Wagon was also very popular during sudden summer downpours! Soon after the observatory was built, members began talking about building a larger telescope. Astrophotography was a strong interest among many people, but the current instrumentation was not suitable for serious work in the field. Additionally, electronic imaging was on the horizon and a more stable platform was required to carry the sophisticated equipment. Part of the vision included an electronic pointing system, which was virtually unheard of in the amateur astronomy of the day. In 1984, charter NCSF member Alvin Panarusky funded the creation of a larger, research-grade telescope. 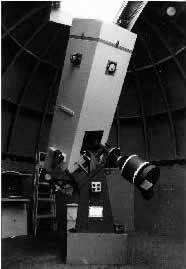 The Panarusky Telescope, as it was named, was designed to be a professional-grade instrument that could be built with the talent and resources available within the membership. 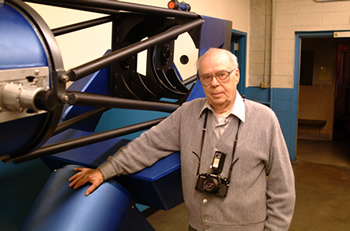 Over the next 18 years, while a few very dedicated members created the telescope part by part, Alvin quietly provided for the continuation of the project behind the scenes. Alvin was on hand when the telescope saw “first light” on May 15, 2002 — the realization of a dream he shared with his fellow NCSF members. He passed away on February 24, 2006 at the age of 93 years, six months before the telescope that bears his name was installed at Harringon Beach State Park. Robert Sedgwick. Sedgwick is a mechanical engineer who spent a large part of his career designing precision machine tools at Kearney and Trecker. In addition to the telescope, he designed and built two automated mirror grinding machines — one for the massive 20″ full-thickness mirror blank, and a smaller model for fabricating the secondary optical elements. In 2002 the Panarusky Telescope neared completion. Kevin Bert, a tool and die maker at Carlson Tool & Manufacturing of Cedarburg, did the vast majority of the work over nearly two decades. 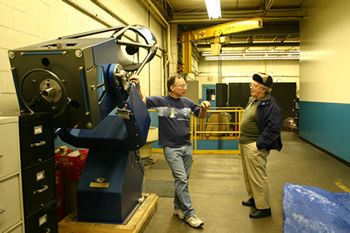 One of Kevin’s telescope-making mentors, Joe Reimbold, consulted with Kevin and Robert Sedgwick often during the project. In the picture at left, Kevin (left) and Joe (right) discuss construction details of the telescope a few days before it’s public debut in the Carlson parking lot. In 2004 serious talks were held between the NCSF and Harrington Beach State Park. As a result of those talks, the NCSF was given permission to build an observatory at the park. Backyard Observatories of Ohio was contracted to build the 16’x24′ structure, which was the largest structure in the companies history. A crew of four came out to Harringon Beach and spent a few days hammering and sawing. After working out some minor issues with the drive train for the retractable roof, the observatory was finished. Several weeks later, the Panarusky Telescope was installed. 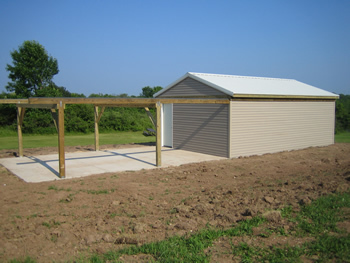 On July 21, 2007, the Jim & Gwen Plunkett Observatory featuring the Panarusky Telescope was dedicated.